This mosaic was commissioned for an electricity sub station building part of the estate refurbishment in Poplar, east London. The idea behind the mosaic design was to show the nature of the power hidden behind this anonymous brick built block. 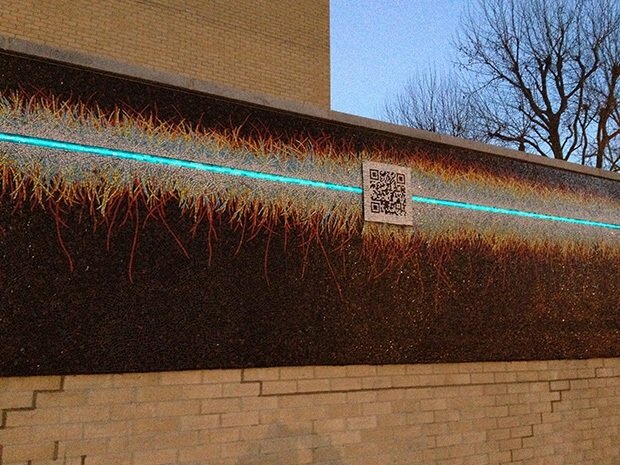 The mosaic represents the flow of electrons along a circuit which runs around the building. Reflecting the connection between electro magnetism and the visible spectrum the electrons are seen as spikes of colour running along and flying off from the current. As the sky gets dark in the evening the central ‘circuit’ lights up, achieved by placing electro luminescent tape behind transparent glass smalti. The mosaic won the award for ‘Contemporary Innovation’ at the 2014 Mosaic Arts International exhibition in Houston, Texas.